UK, US and French Governments Jointly Respond to Assad Syrian Atrocity By Howard Wheeldon, FRAeS, Wheeldon Strategic Advisory Ltd.
UK Prime Minister Theresa May and French President, Emmanuel Macron issued separate statements earlier this morning following the 0200 GMT announcement from US President Donald Trump in Washington DC that the United States together with its UK and French allies had launched separate airstrikes on Syria. NATO Chief, Jens Stoltenberg, Belgian Prime Minister Charles Michel, Canadian Prime Minister, Justin Trudeau and US Senator, John McCain are just some of those who have been quick to applaud action taken by the three allied nations in Syria last night. There will of course continue to be a wide range of differing views and opinions expressed but in so far as the UK is concerned I believe that the limited and targeted precision attack response ordered by Mrs. May to have been absolutely right. As to whether the UK Parliament should have been consulted first I personally believe that, advised by the National Security Council and defence chiefs, it is to the Prime Minister and the Cabinet that we look for important and immediate decisions that may impact on our national security to be taken. I will make no comment on views already expressed by the leader of Her Majesty’s Opposition but I will suggest that had the House of Commons been recalled or been asked to vote next week when it returns from the Easter recess that Mrs. May would have been given the support that she required by a majority of MP’s of all parties. That is how we do things in the UK, standing firmly in support of any Prime Minister charged with making decisions that relate to national security or that threaten a break-down of international rules based order. In terms of specific UK action last evening, at 0200 Hours BST, the UK joined US and French Allies in a range of precision guided weapon attacks on various Syrian installations involved in the regime’s use of chemical weapons against its own people. The UK action was proportionate and specifically aimed at degrading the Assad regime’s ability to use chemical weapons and deterring further such appalling acts and thus it had been specifically focused on regime facilities linked to the production and use of chemical weapons. The UK element of this carefully coordinated joint action was contributed by four Royal Air Force Tornado GR4 air-to-ground attack aircraft based at RAF Akrotiri. These aircraft launched MBDA manufactured Storm Shadow cruise missiles targeted at a military facility (a former missile base about fifteen miles west of Homs) where the Assad regime is assessed to keep chemical weapon precursors stockpiled, this being in clear breach of Syria’s obligations under the Chemical Weapons Convention. Very careful scientific analysis had been applied to determine where best to target the Storm Shadow missiles in order to maximise the destruction of the stockpiled chemicals and to minimise any risks of contamination to the surrounding area. The facility which was struck is located some distance from any known concentrations of civilian habitation, reducing yet further any such risk. US Tomahawk missile attacks appear to have been targeted on a scientific research facility in Damascus that is alleged to be connected to the production of chemical and biological weapons, a chemical weapons storage facility west of HOMS together with a chemical weapons equipment storage site and separately, an important command post near Homs and specific chemical weapons sites around Damascus. Syria is claiming to have shot down a number of the missiles although as yet, there is no available evidence in respect of either mission success or of precision weapons being destroyed before they hit the pre-planned target. Russian claims that its ally Syria shot down 71 of the total 103 missiles launched last night in the coordinated attack that I am told lasted no longer that 70 minutes are highly suspect. For my part, I express nothing other than total support for the actions that the three key governments have taken in response to the chemical weapon attack by the Assad regime on its own people last weekend. Had the West failed to respond I believe that we would have seriously risked exposing not only weakness to our would-be enemies but also any remaining credibility for supporting rules based order. This was then, in my view, a principled and well thought out one-off military response that should be seen as having deterrence at its core objective. Whilst I am no specialist of international law, it was in my view a justified precision guided weapon attack response aimed to send a reminder to Syria and its Iranian and Russian allies that, in the wake of the one million people who lost their lives in the Great War due to chemical weapons attacks and the many more whose lives were to be subsequently wrecked, that to ensure that nothing like this ever happened again the majority of the civilized world had signed up to a total ban on chemical weapons use, production and storage. In their respective statements, all three leaders emphasised that they were acting in response to the chemical-weapons attack on April 7th that killed as many as 75 people and wounded many more. They also implied that this was a one–off approach and that there are no further plans to attack Syria at this stage. I note too that words spoken by each of the three leaders had not only been well thought out by their advisors but also that they have been perfectly delivered to the letter. We are acting together with our American and French allies. In Douma, last Saturday a chemical weapons attack killed up to 75 people, including young children, in circumstances of pure horror. The fact of this attack should surprise no-one. The Syrian Regime has a history of using chemical weapons against its own people in the most cruel and abhorrent way. And a significant body of information including intelligence indicates the Syrian Regime is responsible for this latest attack. We have sought to use every possible diplomatic channel to achieve this. But our efforts have been repeatedly thwarted. Even this week the Russians vetoed a Resolution at the UN Security Council which would have established an independent investigation into the Douma attack. So there is no practicable alternative to the use of force to degrade and deter the use of chemical weapons by the Syrian Regime. This is not about intervening in a civil war. It is not about regime change. It is about a limited and targeted strike that does not further escalate tensions in the region and that does everything possible to prevent civilian casualties. And while this action is specifically about deterring the Syrian Regime, it will also send a clear signal to anyone else who believes they can use chemical weapons with impunity. At this time, my thoughts are with our brave British servicemen and women – and our French and American partners – who are carrying out their duty with the greatest professionalism. The speed with which we are acting is essential in co-operating with our partners to alleviate further humanitarian suffering and to maintain the vital security of our operations. This is the first time as Prime Minister that I have had to take the decision to commit our armed forces in combat – and it is not a decision I have taken lightly. I have done so because I judge this action to be in Britain’s national interest. We cannot allow the use of chemical weapons to become normalised – within Syria, on the streets of the UK, or anywhere else in our world. We would have preferred an alternative path. But on this occasion there is none. History teaches us that the international community must defend the global rules and standards that keep us all safe. That is what our country has always done. And what we will continue to do. Tonight, I want to speak with you about why we have taken this action. One year ago, Assad launched a savage chemical weapons attack against his own innocent people. The United States responded with 58 missile strikes that destroyed 20 percent of the Syrian Air Force. Last Saturday, the Assad regime again deployed chemical weapons to slaughter innocent civilians — this time, in the town of Douma, near the Syrian capital of Damascus. This massacre was a significant escalation in a pattern of chemical weapons use by that very terrible regime. The evil and the despicable attack left mothers and fathers, infants and children, thrashing in pain and gasping for air. These are not the actions of a man; they are crimes of a monster instead. The purpose of our actions tonight is to establish a strong deterrent against the production, spread and use of chemical weapons. Establishing this deterrent is a vital national security interest of the United States. The combined American, British, and French response to these atrocities will integrate all instruments of our national power — military, economic and diplomatic. We are prepared to sustain this response until the Syrian regime stops its use of prohibited chemical agents. I also have a message tonight for the two governments most responsible for supporting, equipping and financing the criminal Assad regime. To Iran and to Russia, I ask: What kind of a nation wants to be associated with the mass murder of innocent men, women, and children? The nations of the world can be judged by the friends they keep. No nation can succeed in the long run by promoting rogue states, brutal tyrants and murderous dictators. In 2013, President Putin and his government promised the world that they would guarantee the elimination of Syria’s chemical weapons. Assad’s recent attack — and today’s response — are the direct result of Russia’s failure to keep that promise. Russia must decide if it will continue down this dark path, or if it will join with civilized nations as a force for stability and peace. Hopefully, someday we’ll get along with Russia, and maybe even Iran — but maybe not. I will say this: The United States has a lot to offer, with the greatest and most powerful economy in the history of the world. The United States has also rebuilt our friendships across the Middle East. We have asked our partners to take greater responsibility for securing their home region, including contributing large amounts of money for the resources, equipment and all of the anti-ISIS efforts. Increased engagement from our friends, including Saudi Arabia, the United Arab Emirates, Qatar, Egypt and others can ensure that Iran does not profit from the eradication of ISIS. Looking around our very troubled world, Americans have no illusions. We cannot purge the world of evil or act everywhere there is tyranny. No amount of American blood or treasure can produce lasting peace and security in the Middle East. It’s a troubled place. We will try to make it better, but it is a troubled place. The United States will be a partner and a friend, but the fate of the region lies in the hands of its own people. In the last century, we looked straight into the darkest places of the human soul. We saw the anguish that can be unleashed and the evil that can take hold. By the end of World War I, more than one million people had been killed or injured by chemical weapons. We never want to see that ghastly specter return. So today, the nations of Britain, France and the United States of America have marshaled their righteous power against barbarism and brutality. Tonight, I ask all Americans to say a prayer for our noble warriors and our allies as they carry out their missions. We pray that God will bring comfort to those suffering in Syria. We pray that God will guide the whole region toward a future of dignity and of peace. And we pray that God will continue to watch over and bless the United States of America. On Saturday, April 7, 2018, in Douma, dozens of men, women and children were massacred by chemical weapons, in total violation of international law and United Nations Security Council resolutions. 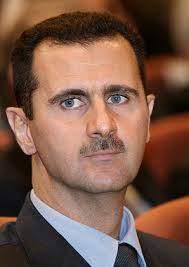 The facts and the responsibility of the Syrian regime are not in any doubt. The red line set by France in May 2017 has been crossed. I have thus ordered the French forces to intervene tonight, as part of an international operation with the United States of America and the United Kingdom, directed against the hidden chemical arsenal of the Syrian regime. Our response has been limited to hitting the capacities of the Syrian regime that permit the production and use of chemical weapons. We cannot tolerate the trivialization of chemical weapons, which is an immediate danger for the Syrian people and our collective security. This is the direction of the diplomatic initiatives put forward by France at the United Nations Security Council. From today, France and its partners will renew their efforts at the United Nations to allow the establishment of an international mechanism to establish responsibility, prevent impunity and prevent any recurrence by the Syrian regime. Since May 2017, the priorities of France in Syria have been constant: End the fight against Daesh [Islamic State], permit access for humanitarian aid to the Syrian civilian populations, to find a political resolution to the conflict so that Syria can finally live at peace, and to ensure the stability of the region. I will pursue these priorities with determination in the days and weeks to come. In conformity with Article 35, Line 2 of the Constitution the Parliament will be informed and a parliamentary debate will be organized, following this decision to use our armed forces in an overseas operation.